Lightwave Frequency Response Analyzer (FRA) by two-tone method should be integrated in the analyzer instrument. ・Sufficient precision frequency measurement of photodiodes and optical receivers for high-speed and high-density optical fiber communications. ・Using a heterodyne method with a highly accurate two-tone signal source. 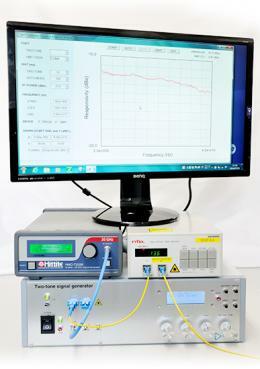 ・Ｈigh accuracy measurement by user-side calibration. ・Applying IEC TC103 international standard for the measurement method.